Bombs explode at Rome embassies Jump to media player Italian police are on alert after package bombs exploded at the Swiss and Chilean embassies in Rome. 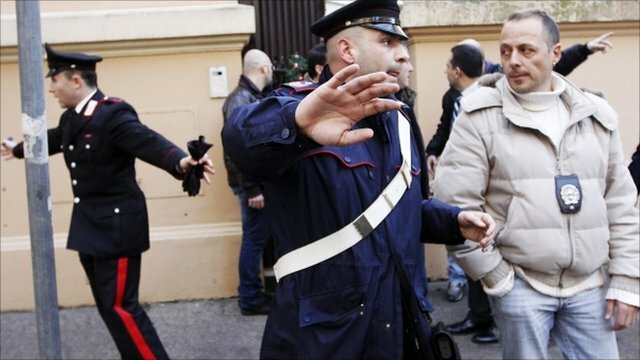 Blasts at embassies in Rome Jump to media player Italian police are searching all embassies and consular offices in Rome after parcel bombs exploded at the Swiss and Chilean missions. 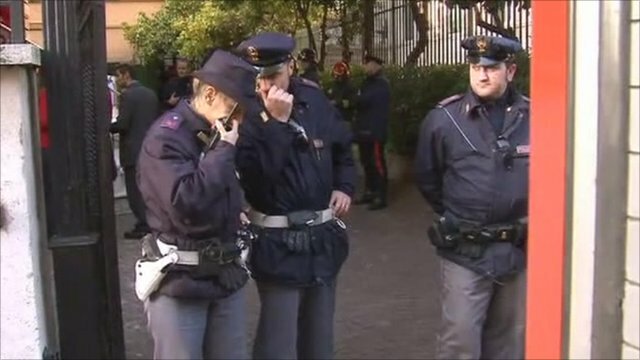 Italian police are on alert after package bombs exploded at the Swiss and Chilean embassies in Rome. Two people who opened the parcels were injured. No one has claimed responsibility but Italy interior minister says investigators believe anarchists may have been behind the blasts. The BBC's Matthew Price reports.